These brownies are rich and delicious, and chock-full of chocolate flavor. These will definitely satisfy your chocolate craving and would be a great gift for your sweetheart (or yourself) on the 14th. One word of warning - don't pull these out of the oven when you might pull out typical brownie recipes (i.e. when the center is still pretty jiggly) - while I find this is the perfect time to pull out brownie-mix-brownies, it left these pretty severely underdone. 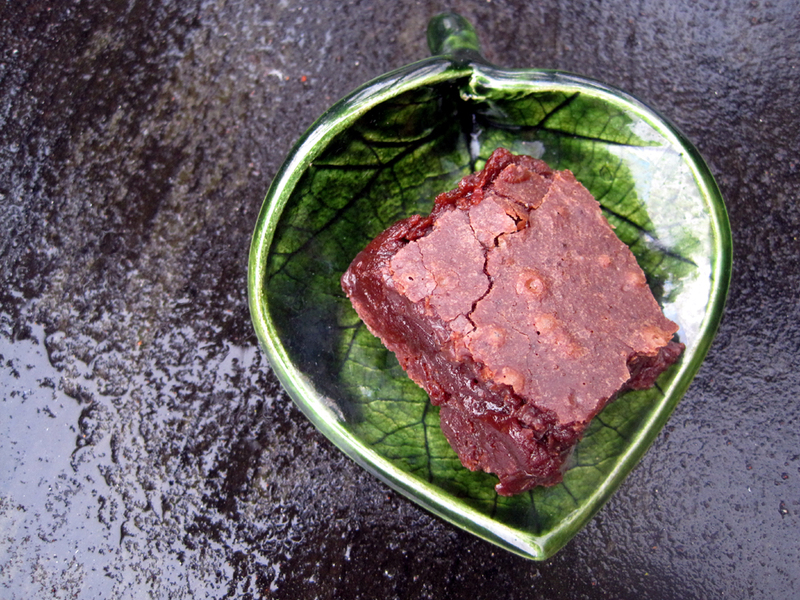 The brownies were still really delicious - but they were almost more like fudge than brownies. Next time I make this recipe, I'll definitely follow the instructions and cook them a bit longer! 1. Heat oven to 350 degrees and spray a 13x9 baking pan with oil. 2. Whisk together the cocoa and coffee. Add the unsweetened chocolate and whisk until melted. Whisk in the butter and oil (don't worry if the batter looks broken; it will come together once the eggs are added). Add the eggs, yolks, and vanilla and whisk until smooth. Whisk in the sugar. 3. Add the flour and salt and mix with a rubber spatula until combined. Fold in the chocolate chunks. These are exactly how brownies should be! Crispy, shiny crust and gooey in the middle (love the chocolate chunks). They look spectacular, Sara! Ooooh, I kinda like how gooey they look! It makes for a pretty photo, anyway. They sound great! I like the crispy top! Thanks for the longer baking tip. i love chewy food stuffs and lots of chocolate.can't wait to make these. Yes, brownies are an excellent choice for Valentine's Day. I love how you have presented your brownie in a heart shaped plate. Your brownie looks moist and delicious.